Its the examination season for first year students of FSC and they all are preparing for their FSC annual exams to perform better and score highest marks for getting admission in medical or engineering courses and FSC students always tend to search online for getting FSC Part 1 Past Papers of Gujranwala board. 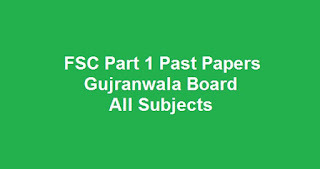 As Gujranwala board is one of the best educational boards in Punjab for intermediate and they do everything on fixed dates, students of FSC Part 1 Gujranwala Board search online for FSC Part 1 Past Papers of all years - so we have to upload fsc past papers. If you are not able to download FSC part 1 past papers lahore board than comment below and we will give you the solution.